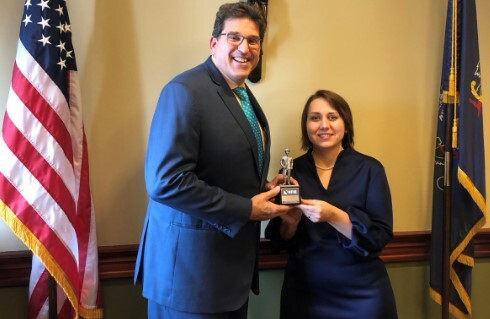 I was honored to receive a Guardian of Small Business Award this week from NFIB, Pennsylvania’s leading small business advocacy organization, for supporting small business legislation. Small business entrepreneurs employ almost half of the nation’s workers. In order to share information and have a dialogue with my constituents interested in specific topics, I have established several citizen advisory committees: Agriculture, Small Business, Sportsmen/women, and Veterans. The next meetings are scheduled for the evening of Thursday, October 11 in Halifax. For more details, sign up on my website or call 717-787-6801. Grant funding for energy efficiency and pollution prevention projects for small business owners and farmers is still available from the Pennsylvania Department of Environmental Protection through the Small Business Advantage Grant program. Businesses can apply for 50 percent matching funds for equipment or materials, up to $9,500, when adopting energy-efficient or pollution prevention equipment or processes. Applications are considered on a first come, first served basis, and will be accepted until fiscal year 2018-19 funds are exhausted, or April 12, 2019, whichever occurs first. The complete grant application package, which includes step-by-step instructions for completing the on-line application as well as all related forms, is available here. The Senate passed legislation on Wednesday intended to help prevent domestic violence cases.House Bill 2060 now goes to the Governor for enactment into law. The measure is similar to Senate Bill 501, which was unanimously passed by the Senate on March 21. The measure does not take firearms away from responsible gun owners, but removes them from individuals who have received due process, and are deemed by the court to be violent and pose a serious threat to others. The committee also held a public hearing on invasive and native species in Pennsylvania. House Bill 1511 amends the Tax Reform Code providing for definitions and the imposition of the hotel occupancy tax, and establishing a restricted revenue account to be known as the Tourism Promotion Fund. House Bill 2060 bill provides for the relinquishment of firearms following a conviction of a misdemeanor offense for domestic violence or the court issuance of a protection from abuse order. The committee also held a public hearing on Senate Bill 1245 and issues relating to the juvenile justice system. Senate Bill 479 provides up to six weeks of unpaid leave to an employee to care for a sibling, grandparent or grandchild with a serious health condition if the individual has no living spouse, child over 17 years of age, or parent under 65 years of age. The Senate will reconvene Monday, October 15 at 1 p.m. You can watch session live at SenatorDiSanto.com.